Tourism NI has launched an exciting new marketing campaign highlighting the beauty of Northern Ireland, featuring the the Causeway Coastal Route. The Say Hello To More themed video features Northern Ireland as a short break destination for visitors. 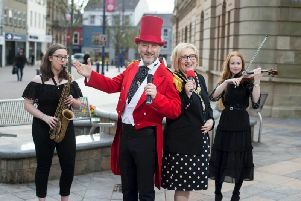 The spring campaign runs until March and features seven unique Northern Ireland themes that will target over four million adults across the island of Ireland and encourage them there are more things to see, do and experience with a short break in Northern Ireland. Amongst the series of ‘thrilling coasts and lakes and castles gardens and more’ itineraries feature Dunluce Castle, Giant’s Causeway, Carrick-a-Rede Rope Bridge and Game of Thrones locations at Dark hedges and Baillintoy Harbour. The Say Hello to More campaign was originally trialled in the Republic of Ireland market last Autumn and resulted in almost 200,000 visits in a three-month period culminating in a significant return on investment. Tourism NI developed a strategic partnership with the NI Hotels Federation, which involved the recruitment of over sixty unique experiences to feature in the spring 2017 campaign. Naomi Waite, Tourism NI Director of Marketing commented; “The domestic and Republic of Ireland market continue to perform strongly for tourism in Northern Ireland with recent statistics showing from January to September 2016 we welcomed almost 1.9m visitors from both markets. Janice Gault, Chief Executive NI Hotels Federation added: “Promotion of the Northern Ireland hotel industry within the domestic and Republic of Ireland market sectors is vital and we are delighted to work in partnership with Tourism Northern Ireland on the Say Hello to More Campaign. To watch the video, click here or visit tourismni.com.